Tuesday – 3 miles in 26:00 on the treadmill at the gym. I think all treadmills should have strong fans attached to them to simulate airflow when running outside. Good grief. Friday – Christmas exchange with Ro! I got her two tickets to The Lion King when it comes to town in February. She’s been wanting to go for awhile, so this should be fun. 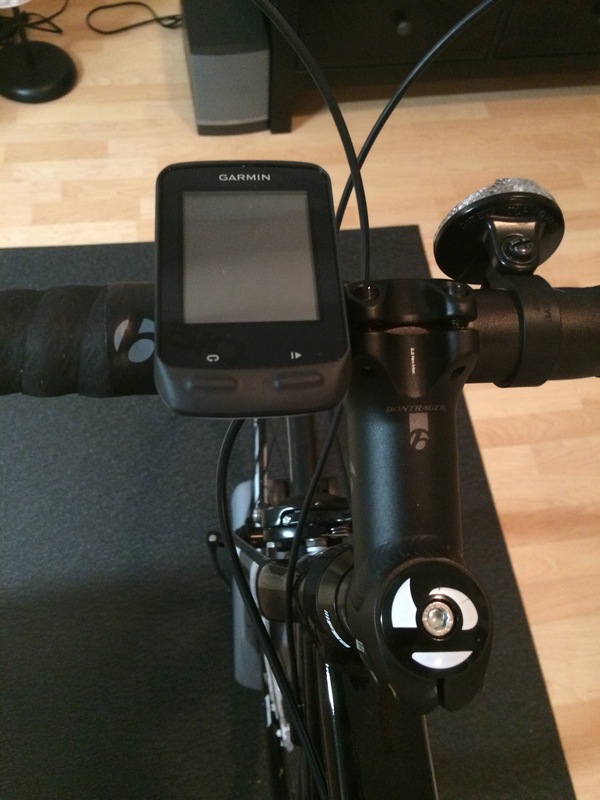 I got a Garmin Edge 510 GPS Bike Computer *, which I had wanted for quite a while. I was so stoked to get it, I set it up that night before going to meet some friends for holiday cheer. Saturday – Too much holiday cheer. I woke up not feeling 100% and decided I wanted to stay on the couch all day. I did manage to get a short, 15 minute spin on my bike. I also set up Bluetooth pairing on the Edge 510 (as well as my Forerunner 220). I really love the auto-upload feature, it makes things so much easier. I was asleep by 9PM. Sunday – The weather was absolutely gorgeous, so I went outside for a 40-minute run. It felt a bit rough, like I was out of breath after only a few minutes. I managed 4.65 miles before my time was up. And again, my watch was paired with my iPhone so it uploaded the data to Garmin Connect right away. Sweep feature! This morning, I hit up the treadmill again for some intervals. I did 5×400, starting at 8.0 and increasing by 0.3 for each successive repeat. It felt pretty easy, but I always feel like that when I run on the treadmill; there’s really just no comparison to outside. With a warm-up and cool-down, I managed to knock out 3.65 miles. I also did some core work before heading back home to get ready for the workday. Diet-wise, I continue to struggle there. Cereal for breakfast, I had teriyaki ginger chicken from Bangkok Alley for my work birthday lunch (they forgot mine….plus two other coworkers, so we went as a group). Leftover pizza from the bar was my dinner, as it was about to go bad so I felt I had to eat it. And I’ve had two cookies. I gotta stop this sweets addiction I’ve got going on. It’s killing me. I’m working on two posts to close out the year: my 2014 year in review and my preliminary 2015 plan and goals. This entry was posted in Health & Fitness, Running and tagged Diet, Running by JB. Bookmark the permalink.